Enniscrone Co Sligo Enniscrone or Inishcrone? The offical spelling of our towns name is "Inishcrone" not "Enniscrone"! When was the official spelling changed to "Inishcrone"? Why was the spelling changed? And why has the local community stuck with "Enniscrone"? These are all questions we hear over and over again from visitors to the town. Even Sligo County Council seem to be a little confused, all you have to do is look at the different spellings on the roadsigns. This plaque is located on main street where the old national school was first built. There are many derivations of the name ‘Enniscrone’ such as Inishcrone, Inniscrone and the Irish equivalent Inis Crabhann. An early written reference to Enniscrone is from a poem dated 1417, where the name is spelt “Enniscrone”. The name recorded locally for the little stream in the Castle Field is the “Inis”; it is possible that the derivation of the name came from this. There are over 30 registered business on the Companies Registration Office (cro.i/search) with "Enniscrone" in the title and none with the spelling "Inishcrone". 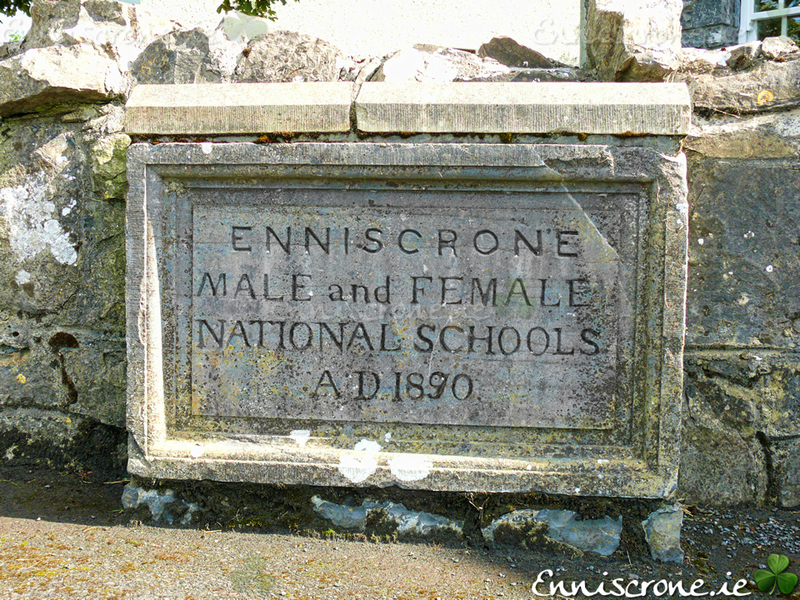 From Wiki: "Up until the late 1970s the name Enniscrone was used by local teachers. It was taught as being a derivative of the Irish "Inis Eascar Abhann" meaning the island on the sandbank in the river." Even the Irish name comes into question, "Inis Eascar Abhann" or "Inis Crabhann"? Can you imaging a a visitor who have never been to Enniscrone before? You pick up a map and see this lovely little town on the coast called "Inishcrone". So whats the first thing you do? a Google search? The search "inishcrone" brings back 140,000+ results, mainly from companies like Daft and Property.ie - "nothing very interesting there, thing we will go somethere different". On the other hand a google search for "Enniscrone" brings back 638,000+ results with all local business and attractions listed. Another interesting search is on the official Sligo County Council webpage www.sligococo.ie. A search for "Enniscrone" brings back 479+ results and a search for "Inishcrone" brings back 4 results! Even if you make it as far as Dubling Airport theat does not mean you will find us! Typing "Enniscrone" into your GPS will not be very helpful in most cases. From a commercial point of view the name really needs to be changed to "Enniscrone" but for now the offical spelling remains "Inishcrone"